Samhita Arni (1984) When she was eight, Samhita Arni started writing and illustrating her first book. “The Mahabharata – A Child’s View” went on to be published in seven language editions and sell 50,000 copies worldwide, winning the Elsa Morante Literary Award, and receiving commendations from the German Academy for Youth Literature and Media and The Spanish Ministry of Culture. 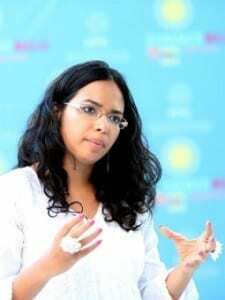 Samhita’s second book, Sita’s Ramayana, a graphic novel developed in collaboration with Patua artist Moyna Chitrakar, was on the New York Times Bestseller list for Graphic Novels for two weeks in 2011. Elle Magazine named Arni as one of twenty young upcoming South Asian writers to watch out for. Her latest book, The Missing Queen, is a speculative-fiction mythological thriller. 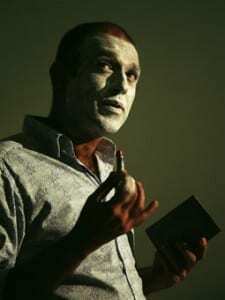 Nikhil Chopra (1974) A performance artist based in Mumbai, India, Chopra creates performances that are a form of storytelling, intermingling familial histories, personal narrative, and everyday life. His work draws on both personal and collective cultural history to examine questions of identity, the role of autobiography, and the politics of posing and self-portraiture. Chopra’s process of performing is a means to access, excavate, extract, and present these themes. His work is site specific: City lights, architecture, landscape, weather, the commotion and chaos of contemporary metropolitan life, evidence of mental and physical stress, and articulations of cultural collective histories and memories all come together in the gestalt that creates the performative space. Rajat Kapoor (1961), is an Indian actor, writer and director. In 1983, he worked with the Delhi-based theatre group Chingari andthen moved to Pune where he studied at the Film and Television Institute of India (FTII). In 1989, he debuted in the film Khayal Gatha byKumar Shahani. In the ‘90s, he started to write and direct short films which would receive many awards and special mentions: in 1994 his documentary Tarana (1994) received three National Awards; another National Award was also won by his work Hypothesis in 1996. He received great attention from the international public and critics by his role as the uncle in Mira Nair’s blockbuster Monsoon Wedding. 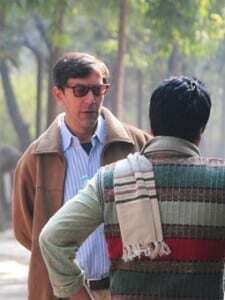 Since then, Rajat Kapoor has written, directed and starred in many successful films such as Corporate, and Bheja Fry while continuing to work in many television series. In 2003, he wrote and directed the film Raghu Romeo which went on to win the National Film Award for Best Film in Hindi. He was also nominated Best Actor for the film Siddhart: The Prisoner at the Asia Pacific Screen Awards. 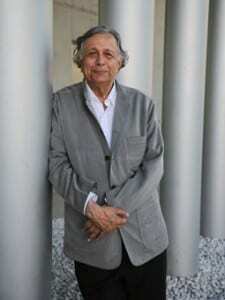 Raj Rewal (1934), one of India’s leading architects, was educated in Delhi and London and worked in Paris before starting his practice in New Delhi. He was a Professor at the School of Planning & Architecture. From the 60s onwards, Rewal had dedicated over three decades to designing some of the most prestigious buildings in India. His humanist approach to architecture responds to the complexities of rapid urbanisation, the demands of climate and cultural traditions. His buildings are based on indigenous crafts and new technologies; his works comprises a wide range of building types including the Nehru Pavilion, the World Bank building, the National Institute of Immunology, the Asian Games Village, the British High Commission, the Library for the Indian Parliament, and the Ismaili Centre in Lisbon, Portugal. His works have been exhibited in Delhi (2004) and in Parma, Italy (2005). He is recipient of several honours including the Gold Medal from the Indian Institute of Architects, Robert Matthew Award by the Commonwealth Association of Architects, the Mexican Association of Architects, Architect of the Year award by JK Trust, the Golden Architect Award by A+D & Spectrum, and the Chevalier des Arts des Letters Award (2005) by the French Government. Siddarth Shanghvi (1977) is an author in English-language, who has been compared to Salman Rushdie and Vikram Seth in his writing styles, especially for using settings of magical realism, themes such as karma, love and sexuality extensively in The Last Song of Dusk (2005, translated into 10 languages, won Betty Trask Award -UK- and Grinzane Cavour -Italy- for the Best Debut novel). After his father was diagnosed with cancer in 2007, Shanghvi turned to photography. His photography series The House Next Door, opened at Galleri Kontrast in Stockholm in 2010. In early 2011 it was shown at the Matthieu Foss Gallery, Mumbai and 2012 in Vadehra Art Gallery, Delhi. He lives between Albany, California, and Mumbai.